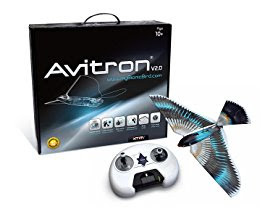 Today (3/30) only this Avitron XTIM AVI2 2.0 R/C Bionic Bird is only $49.99 (Reg. $119.99)! Thanks to ultra-lightweight design and advanced aerodynamics, Avitron’s flapping wings let it to soar high in the sky (up to 328 feet! ), or actually fly at high speed or in your living room at close to hovering speed. And, because of Avitron’s patented steering system, you are always in control! The first radio-controlled robotic animal that looks and moves exactly like its natural counterpart!